The NCI Model 7050 bulk sampling scale with Quartzell digital transducer technology, produces the highest speed and resolution in the industry for USPS bulk mail users. Combining dot matrix alphanumeric display and a tactile keyboard, accurate and easy-to-read information is immediately available. The ability to sample and count from bulk lots increases productivity through piece counting of filled mail trays. Construction Die – Cast aluminum enclosure and load bridge ensures long life. Dot Matrix Backlit- LCD Display Presentation of data is in alphanumeric format. Contrast is adjustable. Serial I/O Ports – RS-232 for printer output. Last transaction Memory – Stores data from previous transaction for instant recall and review. Control Keys – 0-9 keypad plus decimal, Enter, Clear, Tare, Zero, Escape. Soft Function Keys – Sample, Manual Weight, Units, Pcwt, Pc/Lb, Recall, Remote Scale, I.D. Number, Print, Off. Manual Data Entry – Allows keypad manual entry of weight, tare, piece weight, pieces per unit weight and I.D. number. Single Unit Weighing – Can weigh individual pieces by 0.001 lb, 0.01 oz or 0.0005 kg. The NCI 7050 high-resolution bulk sampling scale with dot matrix alphanumeric display and tactile keyboard presents the operator with fast, accurate, easy-to-read information all at one time. 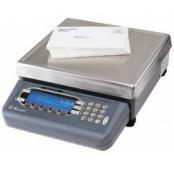 Provides single piece weight and verifies pieces per pound as required on USPS bulk mail forms. The ability to sample and count from bulk lots increases productivity through piece counting of filled mail trays. Piece Weight Computation– Automatically places in lb/pc, oz pc, and kg/pc calculates weigh-per piece to six decimal. Counting– Automatically counts pieces on the weight plaform or on a remote scale, or compute count based on manual weight entry. Counting can be accomplished by sampling or manual entry of piece weight. Print– Pressing PRINT key sends all measured, computed and entered data including I.D. number to label printer. Sampling– Programmable preset or key entry up to 999. Part Number Description Ship Wt. Capacity: 50 x 0.001 lb / Platform: 12"x14"